“JBG SMITH Properties (NYSE: JBGS), a leading owner and developer of high-quality, mixed use properties in the Washington, DC market, is thrilled to announce that Mission, a popular Mexican bar and eatery, will open this summer in the Capitol Riverfront District in Southeast Washington. Mission will be owned by Fritz Brogan and Reed Landry of the Mission Group, and will build on the group’s successful track record with Mission-Dupont and Hawthorne on U Street. 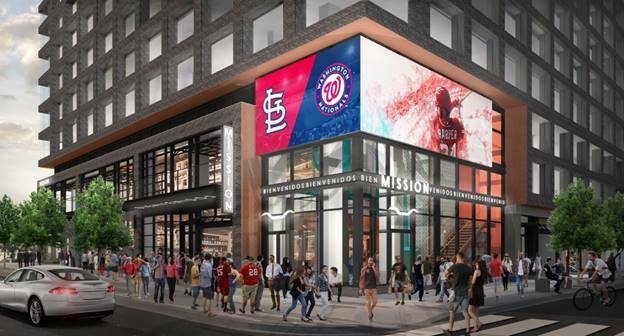 Mission will open in the summer of 2018 in the flagship retail space of JBG SMITH’S new 1221 Van Street multi-family project, located steps from the main entrance to Nationals Park and four blocks from DC United’s new stadium at Audi Field. The food and drink menu at Mission’s Capitol Riverfront location will be similar to that of Mission-Dupont, which opened in 2014. Food selections will include twelve taco options, huaraches, elote loco, nachos and flautas, among many other offerings. The two-level space will encompass more than 10,000 square feet of interior space, an expansive 350-foot wraparound second-floor outdoor balcony, plus a two-story glass storefront overlooking the stadium entrance. Six garage doors lead to a variety of indoor and outdoor dining spaces, bar and private event spaces. Mission will also feature four bars — including the city’s longest bar at more than 120 feet — with nearly two dozen selections of beers, margaritas, wines and champagne all on tap. “Half a block from the White House”!! !